Lizard Man Sightings Reported in South Carolina?! The fabled Bishopville South Carolina swamp creature known as Lizard Man appears to have surfaced again Sunday afternoon. 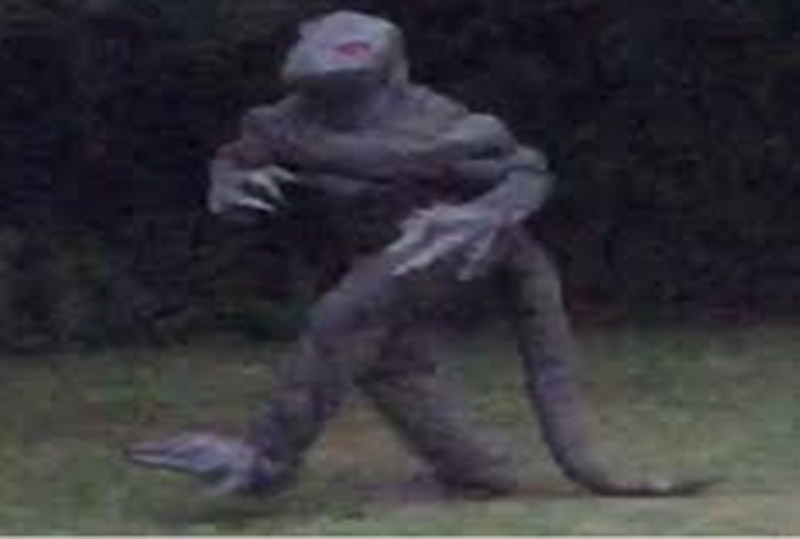 The Lizard Man of Scape Ore Swamp (also known as the Lizard Man of Lee County) is a reptilian humanoid cryptid which is said to inhabit areas of swampland in and around Lee County, South Carolina along with the sewers in towns near the swamp. There have been plaster casts of the mythical beast’s claw. There have been million-dollar rewards to capture the Lizard Man alive. But the creature has not been seen in more than a decade — until now, possibly creating yet another ripple in the swampy waters around Bishopville. In the month that followed the Davis sighting there were several further reports of a large lizard like creature, and of unusual scratches and bite marks found on cars parked close to the swamp. Most of these are said to have occurred within a 3-mile (5 km) radius of the swamps of Bishopville. Two weeks after the Davis sighting, the sheriff’s department made several plaster casts of what appeared to be three-toed footprints – measuring some 14 inches (36 cm) in length – but decided against sending them on to the FBI for further analysis after biologists advised them that they were unclassifiable. According to South Carolina Marine Resources Department spokesperson Johnny Evans the tracks neither matched, nor could be mistaken for, the footprints of any recorded animal. Evans also dismissed the possibility that they could have been made by some form of mutated creature. The sightings attracted tourists interested in seeing the creature and hunters interested in tracking it, and nearby radio station WCOS offered a $1 million reward to anybody who could capture the creature alive. More Sightings Over the Years! In February 2008, a couple in Bishopville, South Carolina, Bob and Dixie Rawson, reported strange damage to their vehicle, traces of blood, and the disappearance of some of their cats. Based on how the damage looks, some have claimed that this is the “return” of the Lizard Man. The blood traces from the Rawsons’ vehicle were sent to a Veterinary lab in California and were found to be from a domestic dog. Lee County Sheriff E.J. Melvin believes it was a coyote or wolf. Soon after the incident at the Rawsons’ home, Lee County Sheriff E.J. Melvin discovered a dead cow and a dead coyote in a field next to the Rawsons’ home. In 2011, Bishopville, South Carolina residents, Leon and Ada Marshall, reported that their car had been mauled by some kind of animal. Former Lee County Sheriff stated that the damage on the car looks much like the damage from earlier incidents. Deputy Fletcher Williams inspected the car and surmised that teeth were responsible for the damage, as if the car had been “chewed up.” To further suggest that an animal had been the vandal, a clear trail of saliva was visible from “the front passenger door across the front of the vehicle to the driver door” and on the discarded strips of bumper material. He also found long white and brown hairs. This could be a elaborate hoax or there is really a Green upright walking Lizard with glowing red eyes roaming South Carolina?